CDMG Case Study: Constitution Mining Corp.
Headquartered in Buenos Aires, Argentina, Constitution Mining Corp. is an international gold mining and exploration company founded on hard money principles. With the faltering economy, a weakening dollar and the rising price of gold, more investors were seeking hard money investments. Constitution Mining recognized this as a unique opportunity to build its brand recognition—and it needed a powerful new lead-generation program to do it. The executive board turned to Creative Direct Marketing Group, Inc., to find out how they could grow their internal database and drive traffic to their newly launched website. And they wanted to accomplish this using online channels. The team at Creative Direct Marketing Group began to craft a winning lead-generation strategy that would drive traffic to the corporate website. 1. Identify the best audience. CDMG knew the best prospects would include hard money investors, conservatives and Libertarians who shared Constitution Mining’s dedication to hard money principles and free enterprise. 2. Create a powerful value-added offer. Prospects would need a compelling reason to visit Constitution Mining’s website—and designing the right offer would be critical. 3. Implement targeted paid search ads, also known as pay-per-click, or PPC. Expertly targeted direct response copy was necessary to attract prospects searching investment-related themes online. To create a successful lead-generation program, the CDMG team profiled eight potential prospect groups that would yield the most profitable leads. The campaign needed just the right offer to qualify leads and capture their contact information for future marketing efforts. They accomplished this with the Honest Money Challenge and a free Special Report. Four to five ads were written for each theme, paired with a corresponding set of keywords that actual investors were using in their searches. 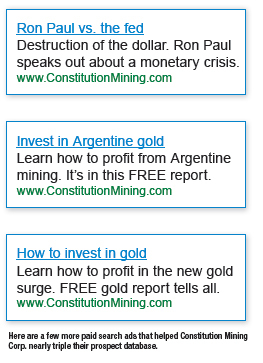 The ads were placed to appear when prospects were searching for topics like bullion, gold mining, gold prices, Libertarian politics, natural resource stocks and much more. was critical to the success of the campaign. When prospects arrive at a new website, they could click away in as few as 2.5 seconds if they don’t immediately see what they’re looking for. After submitting an entry, the prospect was greeted by a thank you page. This final step featured copy to reinforce Constitution Mining’s unique position against a declining dollar. Thanks to well-targeted direct response copy and a strong offer, CDMG’s paid search campaign far exceeded Constitution Mining’s expectations. The top performer was in the low cost stocks group that generated a conversion rate of nearly 50%. The runner-up was an ad from the gold investment/gold mining group, which pulled 16.67%.